Braids 2012 is all over and all the British attendees must be back home now wondering what hit them. Many of the foreign visitors went off to families or packed their things into rented vans and hit the road leaving just Elizabeth Kolb of Canada, Ingrid Crickmore of the USA and myself, all of us more or less “homeless”, together here in the MMU dorms. So, what did we do with our time alone here? Ingrid and I had a fun morning checking out the Costume Museum and the Ede festivities in a nearby park yesterday. Today we all caught up on some much needed sleep and laundry then of course, of course, what else?…we braided. I spent this afternoon editing my pictures and wondering why I hadn’t taken a whole lot more. This is the first big conference at which I have registered, signed up for classes and taught which meant that there really wasn’t much free time to just wander about, soak up the atmosphere and take pictures. 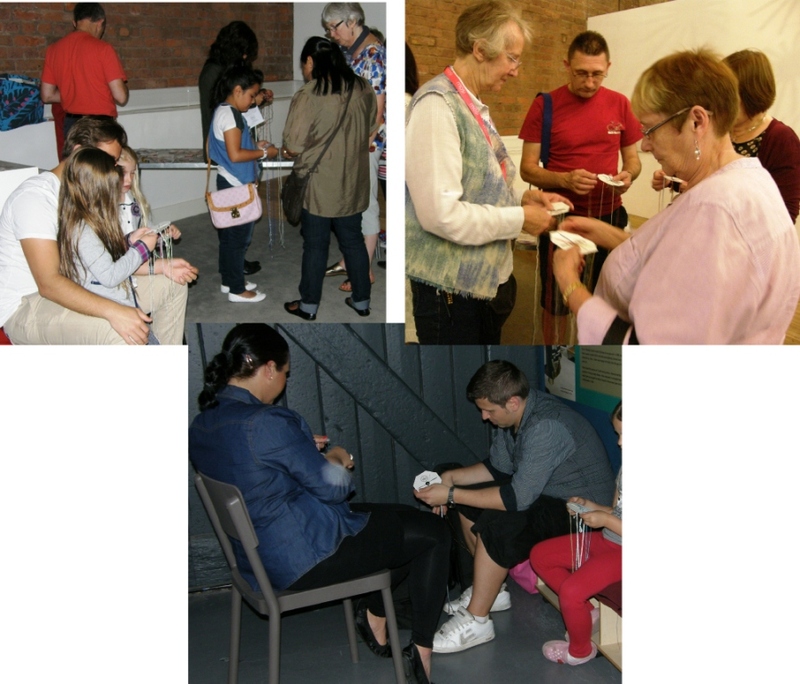 It was up early every day to participate in a steady stream of activities. Coffee and meal breaks seemed to be spent waving the food about in the air in our hands while trying to explain a braiding or weaving move rather than actually consuming the stuff! That is why I have decided to re-name this conference “Hands that Express”. I was getting frustrated with my photos which had been taken indoors in low-light conditions with so much movement going on. My pictures always seemed to show two people in deep conversation with a blur of hands in front of their faces…hands that flitted and floated and turned gracefully in the air as they described their craft. Then I understood that my pictures with the blurred hands actually captured better than anything the spirit and essence of this event….expressive hands, conveying passion and ideas even when not putting threads into motion. Too bad I only realized this after already having deleted many of the pictures! And such interesting hands. Above we see the hands of Errol Pires Nelson of India with their built-in ply-splitting tools. He is starting off a ply-split braid for a new student in one of his many impromptu classes outside his scheduled teaching days. I, too, rely heavily on a long thumbnail as a handy tool for my backstrap weaving, especially for heddle making, but I am a bit shy to leave it long when I am out and about. 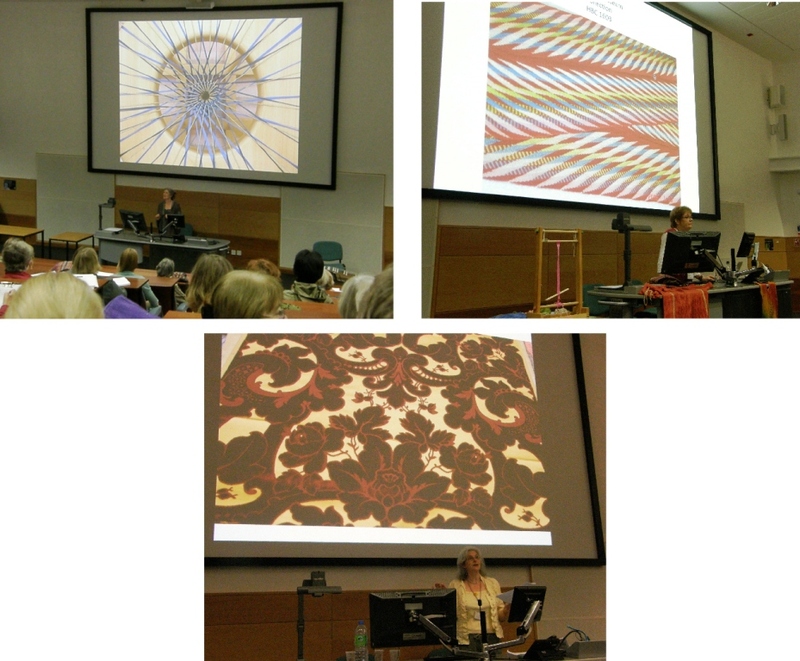 The city of Manchester was a wonderful place for this event with its fascinating role in British and world textile industry history. The MMU made a nice home for us all. I have always loved communal living and staying in the dorms took me back to my ski bum days except that we were all tucked up in bed early each night so we would have enough energy to face the full days of lectures, classes, conversation and all that hand-waving! The little I saw of the city itself was impressive…all that brick and stone…old and new side by side with the gorgeous Palace Hotel, with its landmark clock tower pictured above, built in the late 1800s and early 1900s, standing majestically on the other side of the street from the Holiday Inn Express. The old and new, the very old British structures and the newer items representing the British melting pot of cultures stand sometimes comfortably, sometimes clumsily and very often very colorfully side by side….the lovely old “Picture House” perched on top of the MacDonald’s…. But this is just the quick impression I got from the very little time I got to spend out and about before and after the conference. Day one pre conference was spent settling and meeting my dorm-mates…the “naughty old British ladies” as they called themselves. We spent the first evening putting together “fill-the-gap” braiding kits which we were to use to teach braiding to visitors at the Museum of Science and Industry the following day. These humble “fill-the-gap” kits were responsible for providing a considerable part of the funding for the Braids 2012 event. Braid Society volunteers attended fiber events during the many years of planning, taught braiding and sold the little kits. 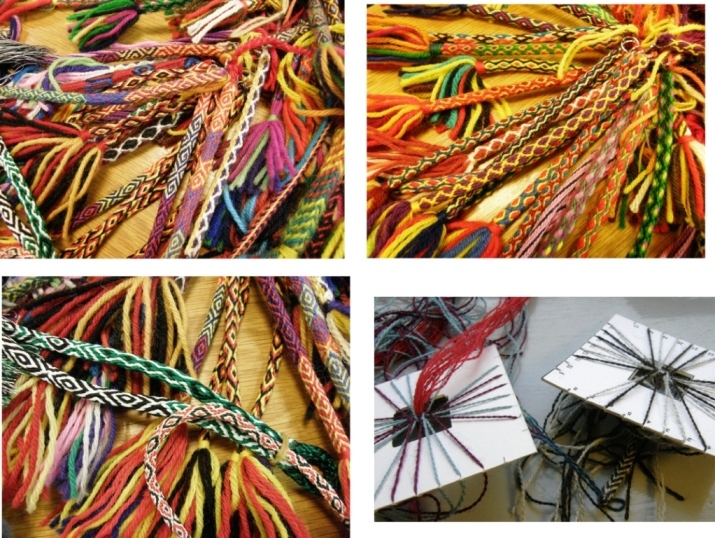 Hundreds of people were introduced to this fun craft for a tiny fee which helped make Braids 2012 possible….impressive! 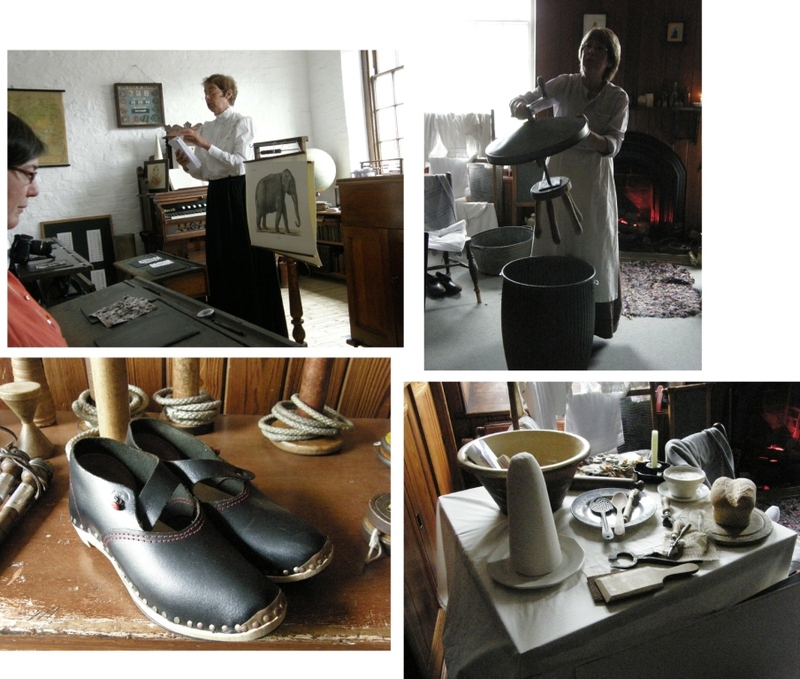 It was a lot of fun seeing Rosie and Sally in action at the museum. Of course they had no problem getting kids to try braiding. It was a little more difficult convincing some of the adults but Sally and Rosie obviously had a lot of experience with this and their cheeky sense of humor soon had entire families of all ages sitting and standing about completely absorbed in braiding. The kits were free at this event. About 100 braiding kits later….we went directly to the conference opening and were welcomed by the Chairman of the Braid Society, Steve Pretty. Society President Jacqui Carey gave the keynote speech. 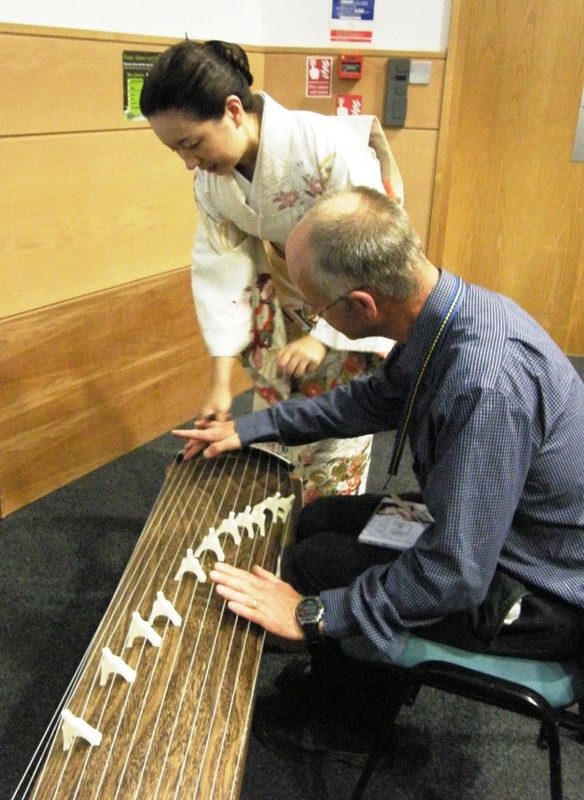 We were then treated to a koto recital by Enokido Fuyuki who then invited us to come and try our hand at this traditional Japanese instrument. Steve Pretty is being given some playing tips below. It was a lovely way to open the event considering the large number of Japanese attendees and the many traditional Japanese braiding techniques that were being offered in the workshops. 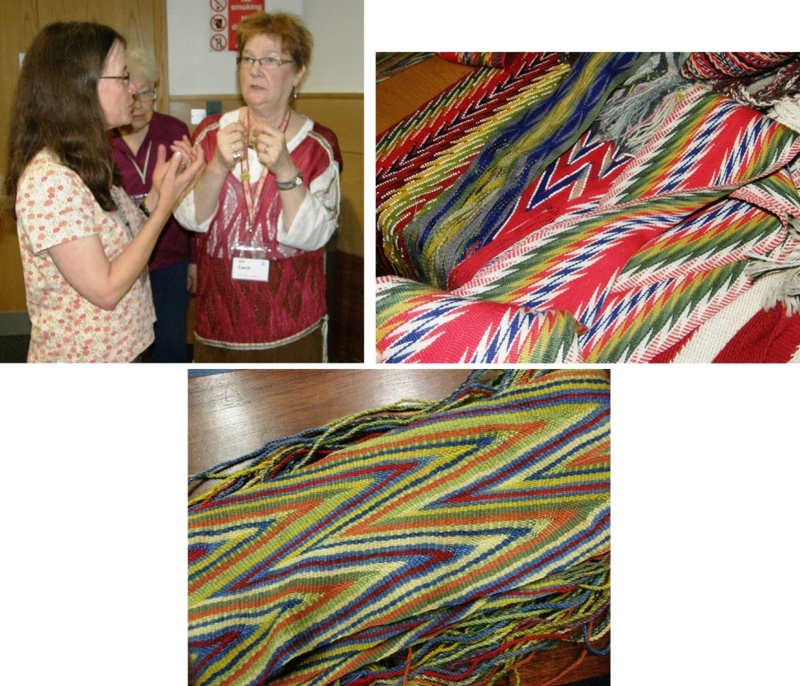 Morning lectures included those offered by Carol James and Stacey Harvey-Brown, pictured above, on North American Braided Sashes and Northwest Archives for Research and Inspiration. There are those expressive hands at work while Ingrid and Carol discuss techniques besides Carol’s display of beautiful finger-woven pieces. 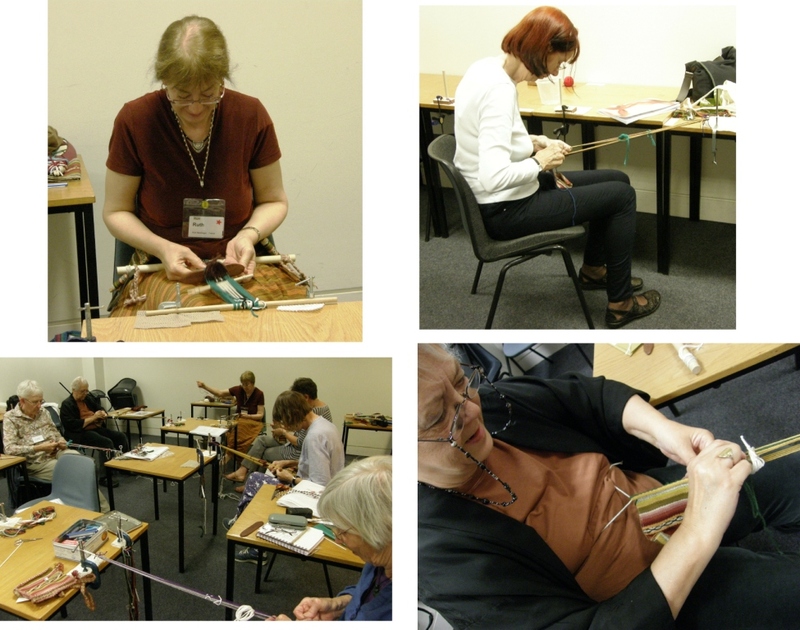 I signed up for Anne Dyer’s class on a technique which she calls “snagging” on tablet-woven bands which has given me some cool ideas for plain-weave tubular bands that I make on my backstrap loom. 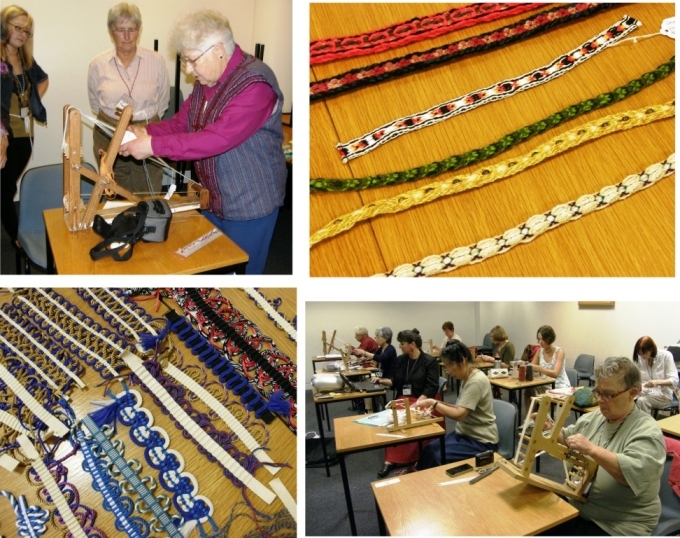 I also took Robyn Spady’s class on handwoven decorative trim on an inkle loom. I was happy to have Susan Foulkes as my classmate and we were both rebels and wove on backstrap looms rather than on inkle looms. Susan used a rigid heddle and I used my usual string heddles and a shed loop. Both instructors gave a us a run down of the technique and a multitude of inspiring samples and then let us run with it and create. It was fun to stop every now and then to take a spin about the room to see which direction the other students were taking. This was very interesting for me as the techniques I teach need to be built up in steps throughout the entire duration of the class leaving little class time for any free wheeling and experiments. Things need to be more structured. It is always so wonderful being a student again and especially in the hands of such great teachers. I get to evaluate the way my classmates and I react to the material, the pace of the instruction and the general learning atmosphere. I learn so much that I can then apply to my own teaching. 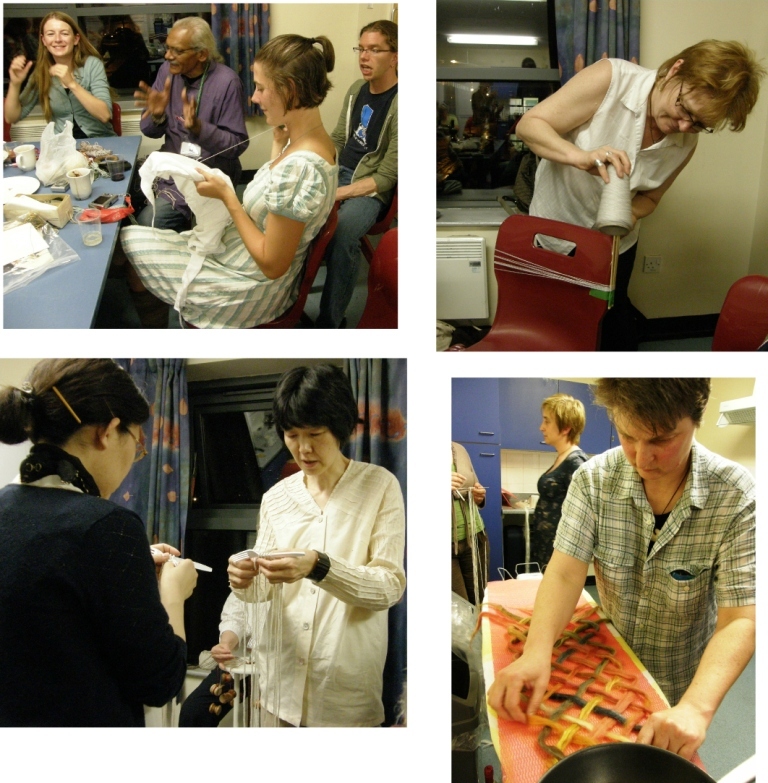 On Monday night we had the Braiders’ Bazaar. I bought nothing! Happily, I was too busy demonstrating backstrap weaving and meeting various online weaving friends as well as talking about my first book Andean Pebble Weave. It was fun to tell an Italian attendant about the translation that has been made of the e-book to her language. Happily, I was also able to show the front cover and also tell everyone about my follow-up book which had just gone up for sale the night before on Patternfish.com. Later I heard about all the wonderful things that had been offered at the bazaar…books, tools, yarn and textiles including some amazing ply-split camel girths, which I did manage to photograph (see above). Ingrid and I were oblivious at our table where I was weaving a pebble weave band on my backstrap loom while she demonstrated how to do what would normally be a two-person/four-handed braid on one pair of hands. Evenings had us gathered in our communal kitchens, showing what we had learned that day and sharing new techniques with the usual flurry of enthusiastic hand gestures….doing the techniques, talking the techniques, watching (although you weren’t allowed to get away with just watching for too long! ), enjoying, discussing…it went on and on. 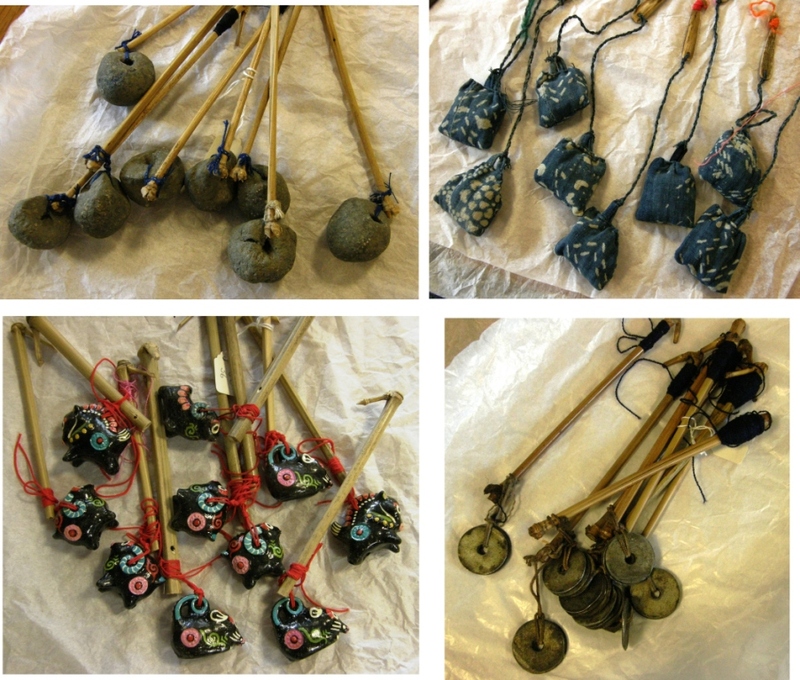 Many a warp was wound…all Carol needed was a chair and pair of chopsticks. With an ironing board and frying pan Helen sets about making a braided and felted scarf. All hands were occupied and, if you walked in without a craft, you would soon find yourself with strings dangling from your fingers as did the Japanese visitors above. 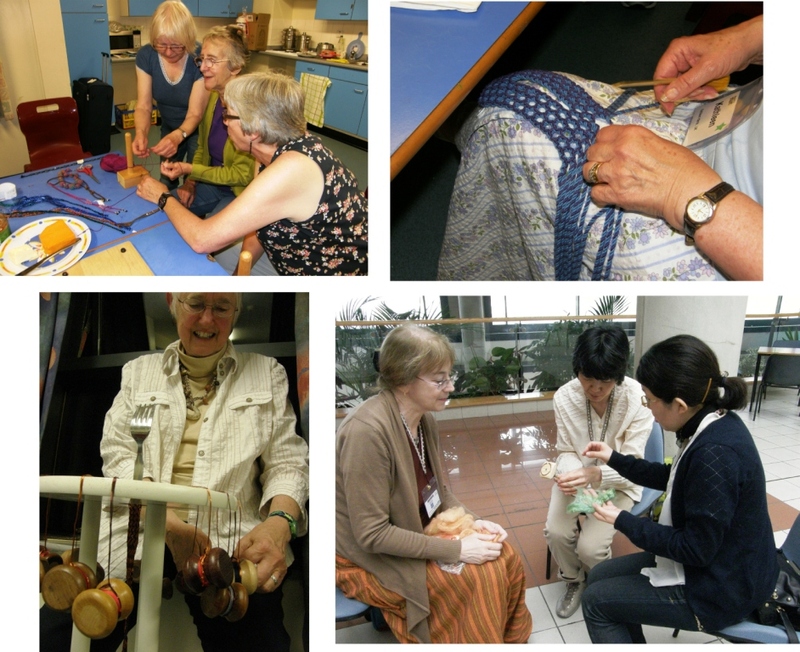 Kathleen has a ply-split scarf in progress on her knee and Sally, Rosie and Phyllis are knotting bracelets. 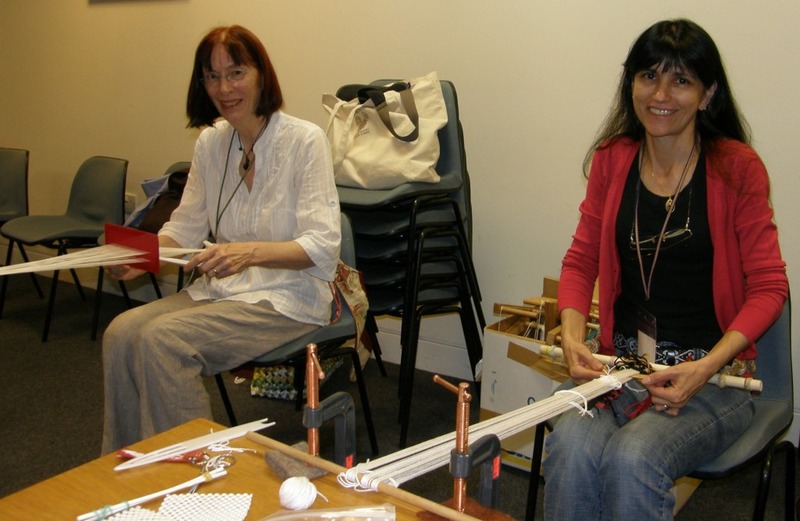 Ruth found the coffee break a good time to teach silk spinning on one of her home made spindles to Mari Omura who lectured on Chinese and Korean loop braids. And if you run out of chairs, as often happened, just perch yourself on the window sill as Shirley did with her marudai. 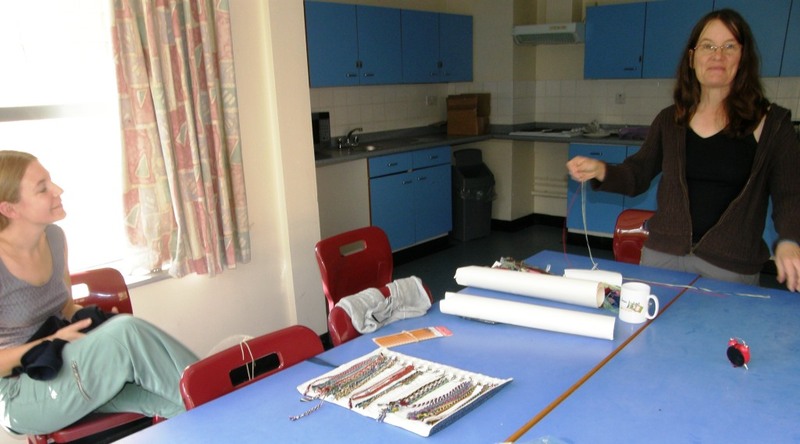 Carol is finger weaving with her work suspended from the kitchen cupboard while Steve and Elizabeth can do their ply-split braiding anywhere anytime without tools or supports. A still moment for a photo op with Anne Dixon…two “warp-faced” ladies, an inkler and a backstrapper who love to weave pick-up patterns. Every now and then we did manage to sneak out of our classrooms to peek into others and the teachers were all very welcoming. I was lucky to find a moment to pop into Rodrick Owens’s classroom and see his stunning display of Peruvian sling braids which has made us all the more enthusiastic about his up and coming book. 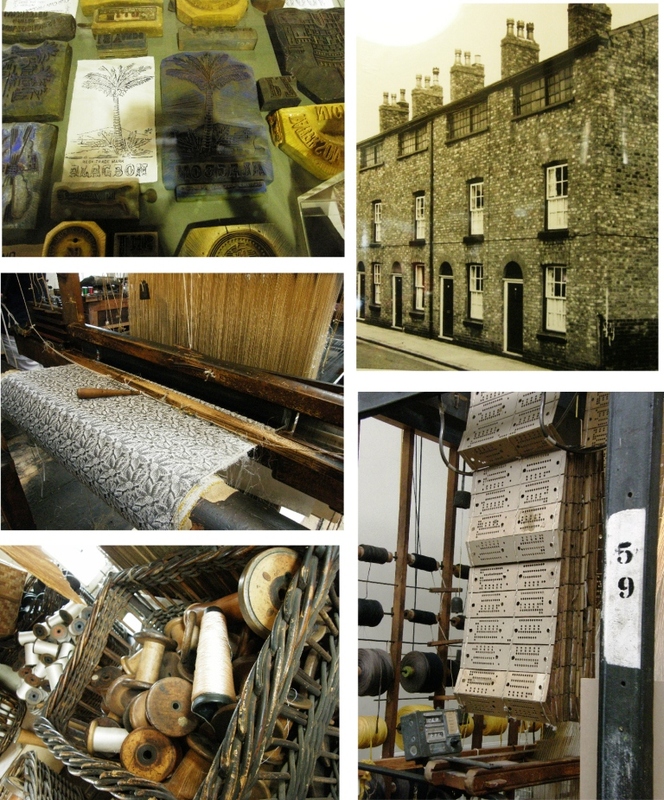 On Wednesday we had what was called a “rest day” and were taken off to be fully immersed in the history of silk weaving in Maccelsfield with visits to the Heritage Center, Paradise Mill and Silk Industry Museum…a wonderful day out. This, along with my weekend visit to the Museum of Science and Industry, gave me a glimpse into life at the peak of the cotton and silk weaving industries in Manchester and Maccelsfield….It really is all too much to go into here…life working in a mill, Sunday school and home life for the working children, the hardships of the mill workers, the cloth, the buttons, the costumes, the magnificent looms and machinery….it was a full day which left our heads spinning. I know that I am leaving you hanging here with a bunch of pictures with no description, but maybe I will be able to elaborate in another blog post some time in the future. Ingrid and I were both slated to weave and braid on Thursday and Friday. 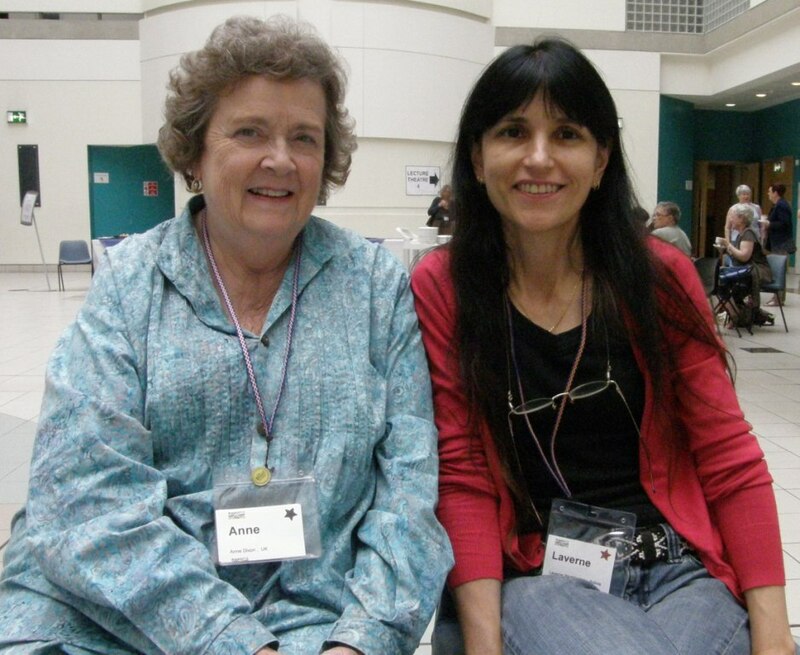 Here’s Ingrid with Debbie Richardson, the amazing organizer of this brilliant event, on Thursday morning. I can see Ingrid’s enthusiasm shining in her eyes. I know that all the braiders were thrilled with her. Errol was also ply-splitting those days and had already made himself a big favorite with his quiet presence and special dry sense of humor. He seemed to be able to just produce out of nowhere at any time one of his fabulous ply-split creations. My goodness, I had a fabulous hard-working group! I suggested we not have tea break on day one and everyone was more than happy to stay in and continue working. We also started at 8am on day two rather than at 10am as scheduled. Why not squeeze as much out of this as we can?! 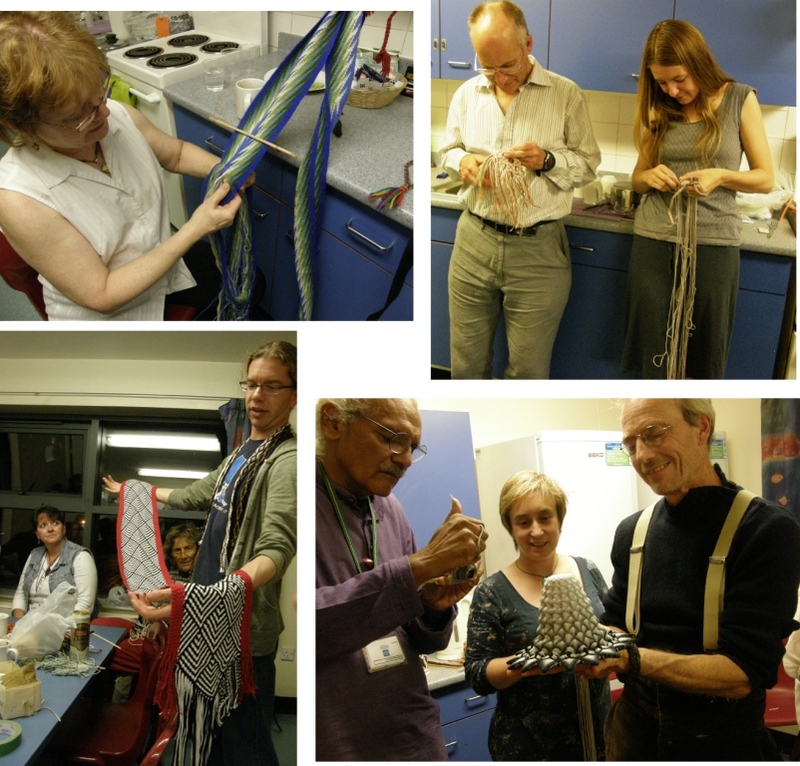 It really was a pleasure to have such keen and tenacious weavers. Susan Foulkes joined us on day two for the Andean tubular band segment. Ruth MacGregor, who edited the conference proceedings (along with Shirley Berlin) was also there with Clare, Margot, Marge, Bridget, Janet and Mayako. Thursday night was banquet night and a chance to congratulate and thank all involved with the organization of the conference before everyone started disappearing on Friday evening and Saturday. At the banquet it was announced that Braids 2016 will be in the hands of Robyn Spady and will be held in Seattle USA. 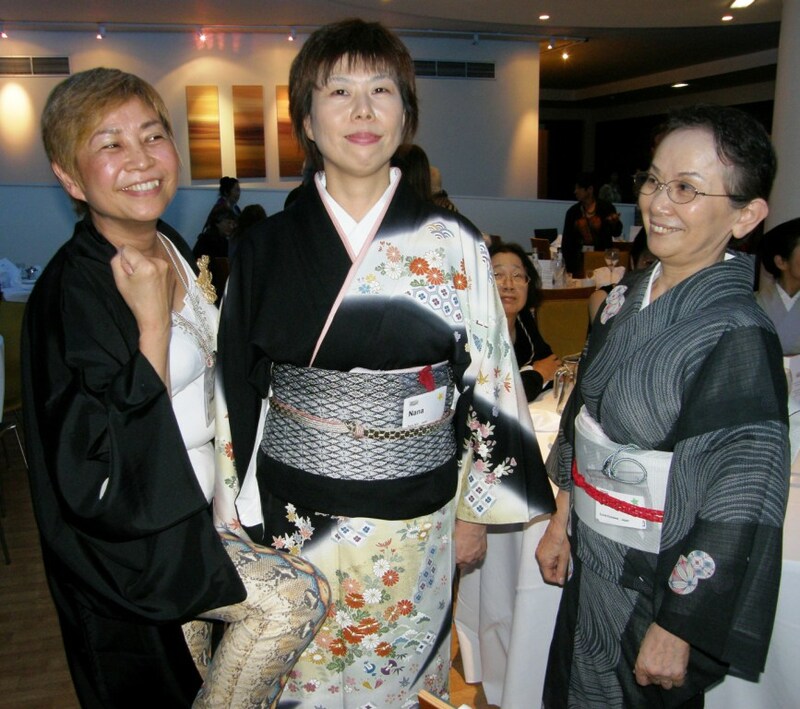 It was a night for dressing up and our Japanese visitors did not disappoint! And that brings me to my last night in Manchester. As I said, I am sitting here looking at the pictures and wondering where the week went and why there are so few pictures to tell this story. I hope I have been able to convey just a little of the fun we had and have you all thinking that maybe a trip to Braids 2016 in Seattle is something you should be planning. Lucky Elizabeth and I got private braiding classes with Ingrid today. I am off to Cambridge tomorrow. I wonder if I will see Elizabeth again somewhere sometime. Ingrid always weaves with me when I am in California so we are bound to meet again soon. That kind of thought always makes the goodbyes easier. 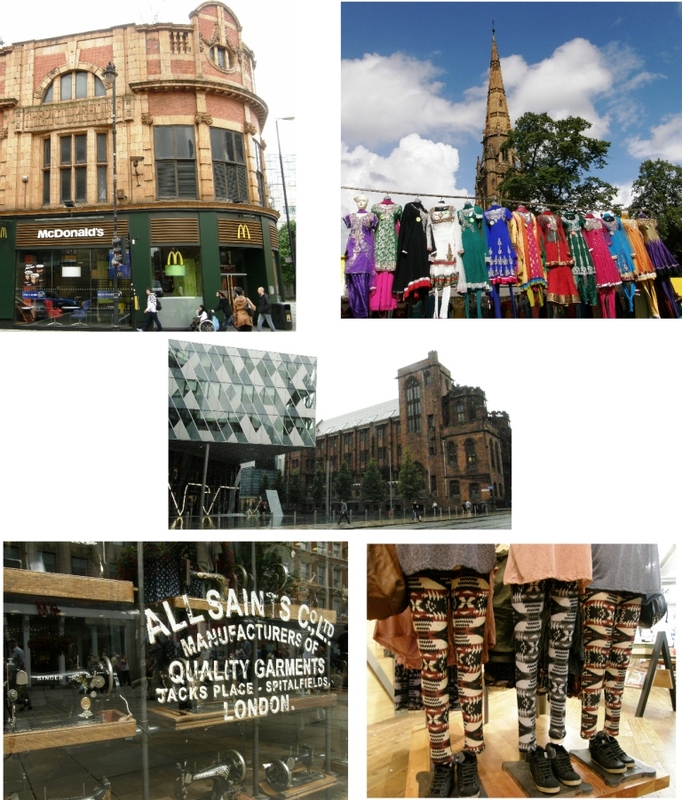 « Backstrap Weaving – Greetings from Manchester! Oh, Laverne! What a magical time! 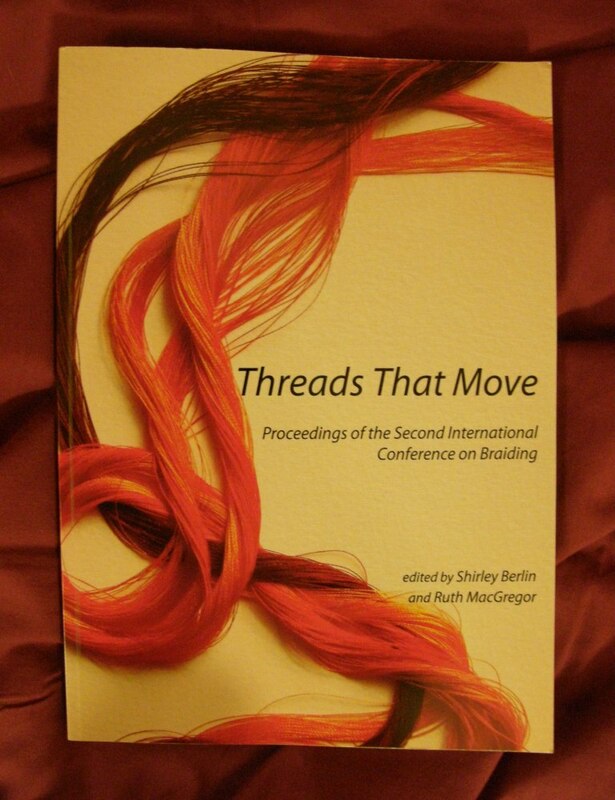 I definitely want to attend the Braids conference in 2016! Thank you so much for all the inspiring photos 🙂 I hope that you will have more to share! Thank you for this report! What a wonderful experience! Thanks a lot for sharing this amazing and inspiring event with us! Sure sounds like a wonderful time. Thanks for letting us have a glimpse. I am sure going to try to go in 2016. This event is so awesome! Thanks for the sample peek into the festivities.I would kill to attend the next event in the US. I will have to work on this. What a wonderful world is opening for me thanks to your blog. Thanks. Wow! that was a whirlwind post of a whirlwind event. I’m glad you had a great time. 2016 in Seattle! Hope to be there. Thanks for the beautiful blog, Laverne. Larry just asked me “what is so exciting about braids? I had to explain….. Wonderful pics, I do believe I’ll see you in 2016. Dear Laverne, it has been a wonderfull time for you . Thanks for shearing it with us. 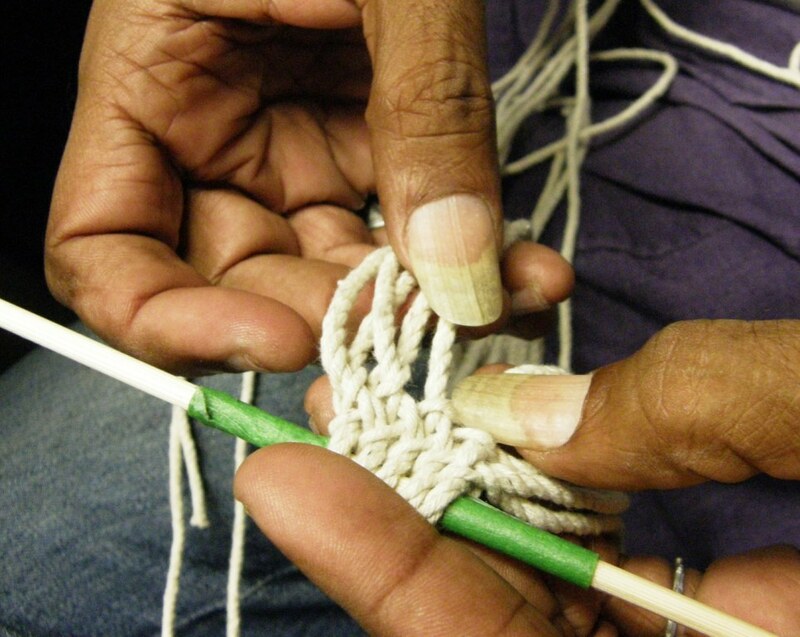 I´m very interested on the Carol James technique, finger weaving. I wonder if you might prepare one of your marvelous tutorials with this … Please!! Hope have a nice trip on coming back to Bolivia. Wow, Laverne! It’s impressive that so many attendees and instructors were from so many different countries, all there to share their talents. From the pictures, it looks like a very energized, dynamic event. 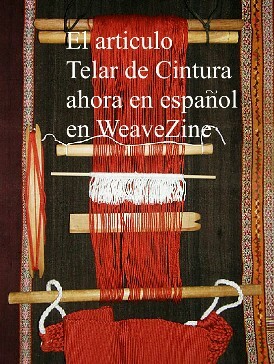 I left Santa Cruz for Patagonia in 1992, and had not met any weavers except those whose work was for sale at Artecampo. 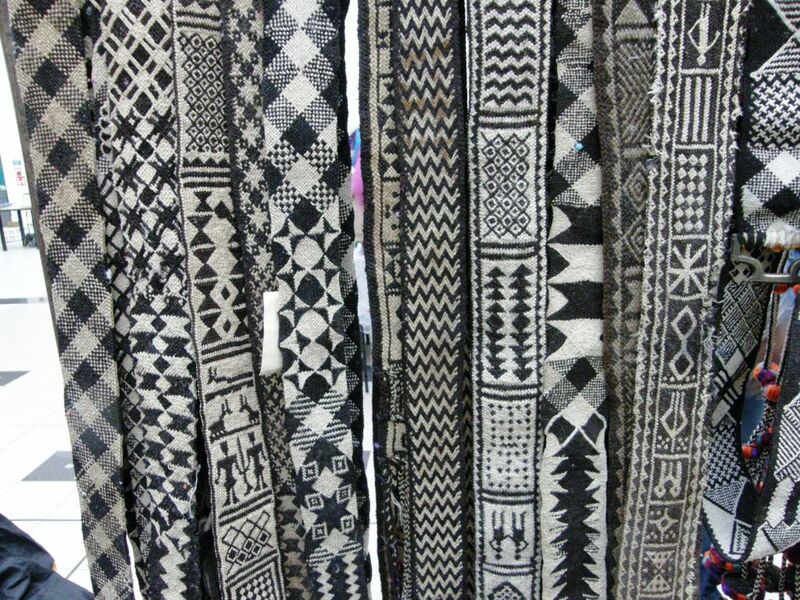 It would be so special to work on Bolivian patterns and learn what I could not learn when I lived there. Thank you very much , Laverne, for this tremendous report and all the pictures.Thank you for sharing with us!